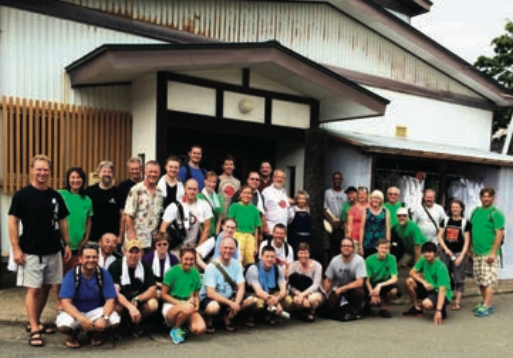 On July 25th I embarked on a two week adventure to Japan with 31 others from the US and Europe. The agenda for our trip was Aikido training with tourism along the way. We all gathered in Narita. 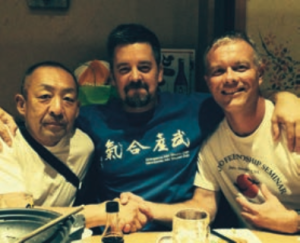 The tour, which was orchestrated by Mark Larson Sensei, began July 29th. We bussed to Tokyo where we all stayed at the Tokyo Business Hotel. That day we had a free day to do whatever we wanted. Three others and I took a walking tour of Tokyo, riding the subway and visiting Tokyo Tower. We also toured the outside grounds of the emperor’s palace. Aikido training began at 6:30 the next morning at the Aikikai World Headquarters Dojo with instruction led by the grandmaster of Aikido. From there we rode a train to Iwama where we stayed and practiced Aikido for the next two days at the Founder’s dojo. Days were long and very hot and humid. Training was strict and tough. Many of us lost skin from our toes from the rough tatami mats. Saturday Aug 1st we boarded a bus for Matsushima. That evening we took a boat tour of Matsushima Bay which is considered one of the three most beautiful places in Japan. Sunday we enjoyed Aikido training with my teacher and friend Kennichi Shibata Shihan. That evening we had one of the wildest parties I have ever been to. Imagine the 32 of us and our Japanese hosts and guests in an all you can drink for one fee establishment. We are quite certain they lost money on our group. 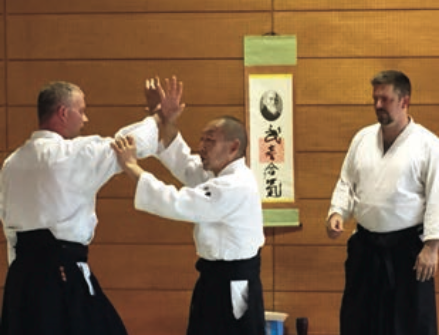 Monday we traveled further north to Akita and spent the next four days at Kawabe Dojo, where Larson Sensei began his Aikido training in 1992. The weather remained hot. Many of us lived and slept at the dojo. There is no air conditioning at dojos in Japan. We slept on rented futons on the tatami mats, whatever sleep that could be had in the heat. Many meals were purchased at a near- by convenience store. There was a coin laundry a short walk away that we all used. The last three days of the tour were spent in Yorihonjo. We visited a Samurai village, a sake distillery, took a train tour near Mount Chokai and met the mayor. We attended a Judo/Aikido friendship training and ended the trip with an International Budo Friendship Demonstration. More than one hundred martial artists displayed their talents to each other and guests. The event was sponsored by the city and was so big it made the newspaper in Akita. It was the greatest demonstration I have ever taken part in. .As I left my hotel room Monday morning August 10th I fought back tears. My journey was nearing its end. I had survived two weeks of tough physical and mental training, little sleep and relentless heat. But we had a blast along the way. Many friendships were renewed and many more were made. We trained together, sweat together, stunk together and bathed together. It was a test of everyone’s spirit. We had some legendary parties and the hospitality was unbelievable. 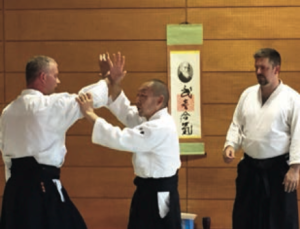 And we received instruction from the best aikido teachers in the world.